Donna Boyd stands at mike during February 21 meeting at hall of United Mine Workers of America (UMWA) Local 2245 in Brookwood, Alabama. She is the sister of Clarence Boyd, who died in a 2001 explosion at the Jim Walter No. 5 mine there. UMWA announced march at that meeting. BROOKWOOD, AlabamaSome 150 coal miners and others gathered February 21 at the United Mine Workers of America (UMWA) hall here for a public forum on the safety crisis confronting mine workers today. At the meeting UMWA vice president for District 20 Daryl Dewberry announced that the union is responding by organizing a march in Montgomery, the state capital. The march is set for March 7, Dewberry told the Militant in a subsequent interview. The keynote speaker at the February 21 meeting was Artur Davis, a member of the U.S. House of Representatives from Alabamas 7th Congressional District, which includes Birmingham and a few coalfields. Davis said he will call for a full-fledged congressional hearing into safety in the mines nationwide. His remarks were followed by presentations by miners, as well as family members of miners killed in a 2001 explosion at the nearby Jim Walter Resources No. 5 Mine. The forum became an open discussion on steps needed to defend workers health and safety in the mines. My life has been put in danger five times in three weeks, said Derrick Barger, a young miner who currently works at Jim Walters No. 5 Mine. Barger described one example in which a Mine Safety and Health Administration (MSHA) inspector had come to look at deteriorating roof conditions in an escape way near his work area, after a complaint had been lodged about the hazardous condition. The inspector said the roof was safe. Barger was given some work to do in that area. Fifteen minutes after he finished the task the roof collapsed where he had been working, the coal miner told the meeting. 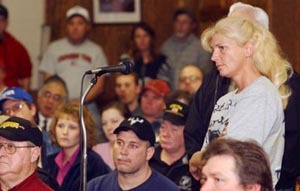 MSHA cannot be trusted to investigate itself, said Freda Sorah, whose husband Joe died in the 2001 explosion at No. 5. After 13 miners were killed in that disaster, Sorah said, instead of strengthening mine safety, the government cut the budgets for MSHA and the state mine inspectors. She demanded that all underground electrical power sources be isolated from the mine atmosphere and equipped with methane sensors that will cut the power automatically. Such measures may have prevented the 2001 explosion, Sorah pointed out. After the Brookwood disaster, what happened at Sago should have never occurred, said Wanda Blevins, whose husband David was also killed in the 2001 explosion. [Labor] Secretary [Elaine] Chao said the exact same thing at Sago that she said after Brookwood. Blevins went to West Virginia to visit the families of the miners killed in the January disaster at the Sago Mine. I told them, You cant trust the federal government, she said. MSHA has allowed more and more mines to use belt air, said James Blankenship, UMWA Local 2245 president. He was referring to the practice of pumping fresh air into the mine down the tunnel containing the belt that delivers coal to the surface. This saves the coal bosses the expense of digging a separate entry to pump air into the mine. Some of the most flammable and toxic materials are found on the belt, Blankenship said. We dont want Omega block seals, said Dwight Cagle, UMWA Local 2397 president and safety committeeman. He was referring to the soft, lightweight blocks that were used instead of concrete to seal abandoned sections of the mine at Sago. The failure of those blocks in the Sago explosion to withhold the blast has been cited as one of the factors that magnified the disaster. We need emergency shelters, said Randell Erwin, an officer of UMWA Local 1948. He pointed out that such underground shelters saved the lives of potash miners in Canada in a mine fire this year. What does it take to get the law changed? asked Donna Boyd in the discussion. Boyds brother Clarence died in the 2001 explosion. Clay Dennison is a coal miner and member of UMWA Local 2133 at the Oak Grove mine near Birmingham, Alabama. Build UMWA march! Back Mexican strikers!